Monocytes play a key role in mobilization of the immune response during sepsis. In response to LPS, monocytes produce both proinflammatory mediators and regulatory proteins that counteract the inflammation and oxidative stress. In murine macrophages, LPS stimulates expression of heme oxygenase 1 (HO-1), a cytoprotective enzyme that catalyzes the degradation of heme. The HO-1 5′-untranslated region, similarly to other cytoprotective genes, contains antioxidant-response elements (AREs) that can bind the transcription factor NF-E2-related factor 2 (Nrf2). At present, the role of Nrf2 in LPS-induced HO-1 expression in monocytic cells has not been investigated. In this study, LPS induced HO-1 mRNA and protein expression in human monocytes and THP-1 cells. Nrf2 translocated from the cytosol to the nucleus in response to LPS and bound to the ARE site in the human HO-1 promoter. In addition, a dominant negative Nrf2 mutant inhibited LPS-induced HO-1 mRNA expression but not TNF-α mRNA expression in THP-1 cells. Ro-31-8220, a pan-protein kinase C (PKC) inhibitor, and Go6976, a classical PKC inhibitor, blunted LPS-induced HO-1 mRNA expression in monocytes and THP-1 cells. Both PKC inhibitors also blocked LPS-induced Nrf2 binding to the ARE. These results indicate that LPS-induced HO-1 expression in human monocytic cells requires Nrf2 and PKC. Heme oxygenase (HO)2 is the rate-limiting enzyme in heme catabolism. It catalyzes the degradation of heme, producing iron, carbon monoxide, and biliverdin. Biliverdin is subsequently converted to bilirubin, which is a powerful antioxidant, by biliverdin reductase (1, 2). In mammalian cells, three HO isoforms have been identified. HO-1 is inducible, whereas HO-2 and HO-3 are constitutively expressed. HO-1 expression is induced in a number of cell types by a range of stress stimuli, including LPS, proinflammatory cytokines, heavy metals, UV light, heat shock, hypoxia, and NO (3, 4, 5). The increase in HO-1 expression by these stress stimuli is thought to be an adaptive mechanism that protects the cells from oxidative damage (6). Cellular levels of HO-1 and other cytoprotective genes are up-regulated by a number of different stress stimuli in mononuclear phagocytes (7, 8, 9). Monocytes and macrophages play essential roles in inflammation and mobilization of the host defense against bacterial infection. LPS, a component of the outer membrane of Gram-negative bacteria, is one of the most potent activators of monocytes and macrophages (10). LPS activation of monocytes results in a wide range of responses, including secretion of growth factors and proinflammatory mediators, expression of adhesion molecules and coagulation factors, phagocytosis, and cytoskeletal rearrangement (11). In response to LPS, mononuclear phagocytes also synthesize intracellular cytoprotective proteins, including heme binding protein 23, heat shock protein 70, and ferritin, which have been implicated in cellular autoprotection against oxidative stress (9, 12, 13). HO-1 is induced in rodent macrophages in vitro and in vivo in response to LPS (9, 14, 15). In addition, the HO-1 metabolites bilirubin and carbon monoxide play a cytoprotective role in rat models of endotoxaemia (16, 17). Exposure of HO-1-deficient mice to endotoxin leads to increased hepatocellular necrosis, increased splenic proinflammatory cytokine secretion, and higher mortality from endotoxic shock when compared with wild-type animals (18, 19, 20). These studies suggest that HO-1 plays an important role in counteracting the deleterious increase in inflammation and oxidative injury associated with endotoxaemia. LPS activates gene transcription by binding to its membrane receptor, TLR4, on circulating monocytes, inducing signal transduction pathways leading to the phosphorylation of kinases, including the IκΒ kinases, protein kinase C (PKC), PI3K, and MAPKs. These in turn activate various transcription factors, including the NF-κB and AP-1 families (21, 22). Song et al. (15) reported that LPS injection of mice resulted in increased HO-1 expression in liver Kupffer cells, which was mediated via TLR4. However, the downstream targets of TLR4 leading to regulation of the HO-1 gene by LPS are unknown. The 5′-untranslated region of the human HO-1 gene contains many stress-activated response elements, including AP-1 sites, hypoxia-inducible factor-1 sites, CCAAT/enhancer-binding protein sites, phorbol ester response elements, heme and cadmium response elements, a κB site, and antioxidant response elements (AREs) (14, 23, 24, 25). The ARE is a cis-acting regulatory element, which is also present in the 5′-flanking region of other cytoprotective genes, including NADP(H) quinone oxidoreductase, thioredoxin, ferritin, and glutamate cysteine ligase (26). The NF-E2 family, which belong to the Cap’n’Collar family of basic leucine zipper transcription factors, bind to the ARE. These include NF-E2, NF-E2-related factor 2 (Nrf2), Nrf1, Nrf3, Bach1, and Bach2. These transcription factors heterodimerize with other proteins, including members of the jun and the small Maf families (27). Nrf2 has recently emerged as a key player in the transcriptional activation of several ARE-mediated genes (28, 29). Nrf2 resides in the cytosol bound to an inhibitor Keap 1. Upon activation, Nrf2 is phosphorylated, released from Keap 1, and it enters the nucleus where it binds to the ARE in the promoters of various target genes (27). Nrf2 has been reported to regulate oxidative stress-induced HO-1 expression in murine peritoneal macrophages (28). A dominant negative mutant of Nrf2 transfected into murine L929 fibroblasts demonstrated significantly reduced HO-1 expression (30). In addition, fibroblasts and lung tissues from Nrf2-knockout mice express reduced levels of HO-1 (31, 32). These studies suggest that, at least in mouse cells, HO-1 up-regulation is dependent on the expression and activation of Nrf2. In this study, the role of Nrf2 in regulating LPS-induced HO-1 expression was studied in human monocytic cells. LPS induced HO-1 mRNA and protein expression via activation of the transcription factor Nrf2. The pathway was independent of the MAPKs, ERK and p38, but was dependent on a classical isoform of PKC. LPS (Escherichia coli serotype O111:B4), SB 203580, Ro-31-8220, PD 98059, Go 6976, rottlerin, and LY 294002 were purchased from Calbiochem. All other chemicals were obtained from Sigma-Aldrich. Human monocytic leukemia THP-1 cells (33) were purchased from European Collection of Cell Cultures and cultured in RPMI 1640 medium supplemented with 10% FCS, 2 mM l-glutamine (BioWhittaker), and 2-ME. HUVECs from pooled donors (Patricell) were cultured in Medium 200, low serum growth supplement, and penicillin/streptomycin/amphotericin B solution (Patricell). Cells were maintained in a humidified atmosphere at 37°C and 5% CO2. Approval for venepuncture was obtained from the Cambridge local regional ethics committee. Heparinized blood was collected from healthy volunteers and human PBMCs isolated by Lymphoprep (Axis Shield) density gradient centrifugation (34). PBMCs (4 × 106/ml) were incubated in complete medium for 2 h at 37°C to allow adherence of monocytes (21). Cell type was confirmed by microscopy and flow cytometry. Cells were unstimulated or stimulated with LPS for various times. Total cell lysates were prepared by boiling in SDS-containing sample buffer for 10 min (Invitrogen Life Technologies). Cytosolic and nuclear extracts were prepared as described previously (21, 35). Proteins were separated by SDS-PAGE on a 4–12% polyacrylamide gel and transferred to polyvinylidene difluoride membrane (Invitrogen Life Technologies). Immunoblotting was conducted using mouse anti-human HO-1 Ab (StressGen Biotechnologies), rabbit anti-human Nrf2 Ab (Santa Cruz Biotechnology), or mouse anti-human β-actin Ab (Sigma-Aldrich). Goat anti-mouse and goat anti-rabbit secondary Abs were purchased from Santa Cruz Biotechnology. Proteins were detected using the ECL Western blotting system (Amersham Biosciences). THP-1 cells were preincubated with kinase inhibitors for 30 min and stimulated with LPS for 6 h. Supernatants were frozen at −80°C until analysis. TNF-α protein in supernatants was measured by ELISA (R&D Systems). The sensitivity of the assay was 6.8 pg/ml. Cells were unstimulated or stimulated with LPS for various times at 37°C. In kinase experiments, cells were pretreated with kinase inhibitors for 30 min before LPS stimulation. Total RNA was extracted from 2 × 106 cells using RNAwiz, according to the manufacturer’s instructions (Ambion). Reverse transcription was performed using the RNA PCR core kit (Applied Biosystems). Real-time PCR primers and probes for GAPDH, Nrf2, and HO-1 were purchased from Applied Biosystems. GAPDH, Nrf2, and HO-1 mRNA levels were obtained by quantitative real-time PCR of cDNA generated from the reverse transcription. Quantitative real-time PCR used a 5′-fluorogenic assay with primers and probes directed against an intron/exon boundary of GAPDH, HO-1, and Nrf2. The sequences of the primers and probes are as follows: GAPDH forward primer, 5′-GCCTCAAGATCATCAGCAATGC-3′; GAPDH reverse primer, 5′-CCTTCCACGATAC CAAAGTTGTCAT-3′; GAPDH probe, 5′-ACCAACTGCTTAGCACCC-3′; HO-1 forward primer, 5′-GCAGAGAATGCTGAGTTCATG-3′; HO-1 reverse primer, 5′-CACATCTATGTGGCCCTGGAGGAGG-3′; HO-1 probe, 5′-CGAGACGGCTTCAAGCTGGTGATGG-3′; Nrf2 forward primer, 5′-CCTCAACTATAGCGATGCTGAATCT-3′; Nrf2 reverse primer, 5′-AGGAGTTGGGCATGAGTGAGTAG-3′; and Nrf2 probe, 5′-CGCAGCGAATATG-3′. TNF-α and 18s mRNA expression were detected by real-time PCR using SYBR green technology. The primers were as follows: 18s forward primer, 5′-CGGCTACCACATCCAAGGAA-3′; 18s reverse primer, 5′-GGCTGCTGGCACCAGACTT-3′; TNF-α forward primer, 5′-GCCCAGGCAGTCAGATCATC-3′; and TNF-α reverse primer, 5′-CGGTTCAGCCACTGGAGCT-3′. After preamplification (50°C for 2 min and 95°C for 10 min), the PCR were amplified for 40 cycles (95°C for 15 s and 60°C for 1 min) on an ABI Prism 7000 Sequence Detection System (Applied Biosystems). HO-1 and Nrf2 mRNA expression were normalized against GAPDH mRNA expression using the standard curve method (Applied Biosystems). TNF-α mRNA expression was normalized against 18s mRNA expression using the comparative cycle threshold method (Applied Biosystems). Oligonucleotide probe containing the human HO-1 ARE site (underlined), 5′-GCATTTCTGCTGCGTCATGTTTGGGAGG-3′ was manufactured and biotinylated by Sigma-Genosys. For competition binding, the same sequence was manufactured without the biotin label (Sigma-Genosys). Nuclear extracts were prepared from 5 × 106 THP-1 cells as previously described (21, 36) and incubated with the biotin-labeled probes using the LightShift Chemiluminescent EMSA kit (Pierce), following the manufacturer’s instructions. For supershift analysis, nuclear extracts from LPS-treated THP-1 cells were preincubated with 1 μg of either anti-human Nrf2 or anti-human p65 supershift Abs (Santa Cruz Biotechnology) for 20 min before gel shift analysis (36). THP-1 cells (2 × 106/well) were transiently transfected with 1 μg of a dominant negative mutant of Nrf2 (pcDNA3DN-Nrf2) (26) or control DNA (pcDNA3) for 48 h, using Effectene transfection reagent according to the manufacturer’s instructions (Qiagen). Transfected cells were left unstimulated or treated with LPS (10 μg/ml) for 4 h before RNA extraction and real-time PCR analysis. LPS has been reported to stimulate HO-1 expression in rodent peripheral blood monocytes and macrophages (8, 9). LPS-induced HO-1 expression was examined in human monocytes and THP-1 cells. We have previously used this cell line as a model for LPS studies in human monocytes (21, 36, 37). LPS stimulated an increase in HO-1 mRNA expression in human monocytes (Fig. 1⇓a) and human THP-1 cells (Fig. 1⇓b), measured by real-time PCR analysis. In both cell types, LPS-induced HO-1 mRNA expression increased by 4 h, increased further by 8 h, and decreased by 24 h. These results demonstrate similar results in both cell types, suggesting that the THP-1 cell line is a valid model for studying LPS-induced HO-1 expression in human monocytes. HO-1 protein expression was examined by Western blot analysis. HO-1 was undetected in unstimulated THP-1 cells (Fig. 1⇓c) and human monocytes (data not shown). In response to LPS, HO-1 protein expression was present by 12 h and remained at 24 h. Immunoblots were reprobed with a mouse anti-human β-actin Ab to confirm equal loading between samples. LPS induces HO-1 expression in human monocytes and THP-1 cells. Monocytes and THP-1 cells were unstimulated or stimulated with LPS (100 ng/ml and 10 μg/ml, respectively) for the indicated times and extracts prepared. a, LPS-induced HO-1 mRNA expression in peripheral blood-derived human monocytes, measured by real-time PCR. b, LPS-induced HO-1 mRNA expression in THP-1 cells, measured by real-time PCR. HO-1 mRNA expression was normalized to GAPDH mRNA levels. Data shown represents three experiments (mean ± SD). c, LPS-induced HO-1 protein expression in THP-1 cells, measured by Western blot analysis. Nrf2 is a key transcription factor in the regulation of cytoprotective genes in murine hepatocytes and transformed cells and binds to the ARE (27). To confirm the presence of Nrf2 in human monocytic cells, Nrf2 mRNA expression was determined in primary monocytes and THP-1 cells by real-time PCR analysis and normalized to GAPDH mRNA levels. To compare basal expression with other nonphagocytic cells, Nrf2 mRNA expression was also determined in HUVECs. All cell types expressed Nrf2 mRNA. Monocytes and THP-1 cells expressed higher Nrf2 mRNA levels than HUVECs (monocytes, 50.01 ± 4.87; THP-1, 97 ± 7.27; mean ± SD, fold increase expression above HUVECs; n = 3). Nuclear translocation is an important mechanism for the activation of Nrf2 (38). To examine whether LPS induced Nrf2 translocation, THP-1 cells were treated with LPS for various times. Cytosolic and nuclear extracts were prepared and analyzed for Nrf2 expression by Western blotting. Fig. 2⇓a demonstrates that Nrf2 was present in the cytosol in unstimulated THP-1 cells but had disappeared by 30 min and had not returned by 4 h. In contrast, Nrf2 was undetectable in the nucleus of unstimulated cells but appeared by 1 h in response to LPS. These results suggest that LPS activates Nrf2 in monocytic cells. LPS stimulates translocation of Nrf2 from the cytosol to the nucleus and binding to the HO-1 ARE in THP-1 cells. THP-1 cells were stimulated with LPS (10 μg/ml) for various times and cytoplasmic and nuclear extracts prepared. 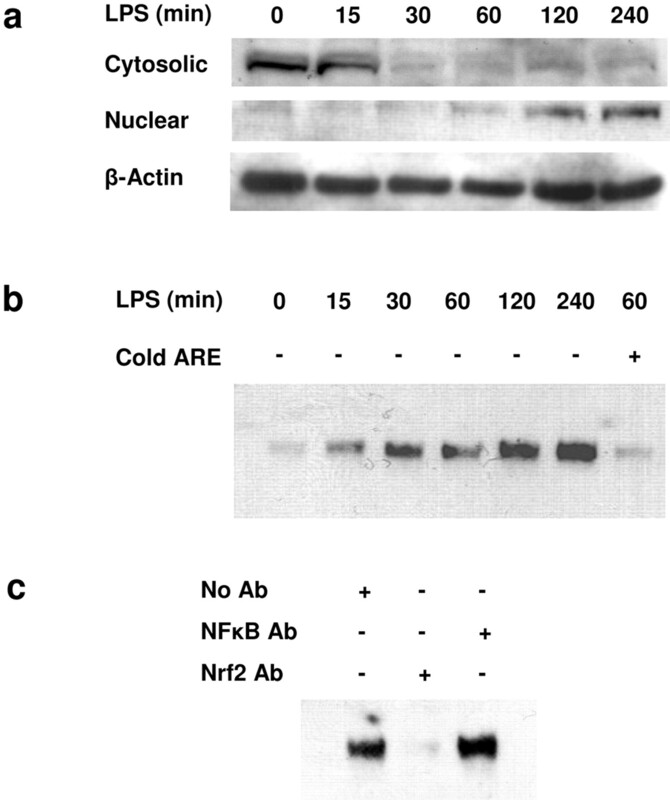 a, Cytoplasmic and nuclear proteins were separated by SDS-PAGE, and Western blot analysis was conducted using anti-Nrf2 Abs. b, EMSAs were performed using LPS-stimulated nuclear THP-1 extracts and biotinylated a HO-1-ARE probe. An unbiotinylated HO-1 ARE oligonucleotide probe was used as a cold competitor (as indicated). c, Nuclear extracts from THP-1 cells stimulated for 1 h with LPS were preincubated with 1 μg of anti-Nrf2 or anti-p65 supershift Abs, before EMSA. To determine whether LPS induced binding to the ARE of the HO-1 gene, nuclear extracts from LPS-treated THP-1 cells were prepared and EMSA conducted using a human HO-1 ARE consensus sequence (Fig. 2⇑b). No complex was detected in unstimulated THP-1 cells. In response to LPS, an ARE-binding complex appeared by 15 min and binding continued to increase up to 4 h. The kinetics of this binding matched the disappearance of Nrf2 from the cytosol of THP-1 cells in response to LPS. The binding of the complex was specifically inhibited by the addition of unlabeled oligonucleotide (competitor). To determine whether Nrf2 was present in the complex that bound to the ARE, supershift analysis was performed using anti-human Nrf2 supershift Abs. Anti-p65 supershift Abs were used as a negative control, as we have previously demonstrated, that LPS induces the NFκB family member, p65, in THP-1 cells and the HO-1 promoter contains two NF-κB consensus sequences (21, 39). The DNA-protein complex bound to the HO-1 ARE was abolished with anti-Nrf2 Abs but not anti-NFκB Abs (Fig. 2⇑c), demonstrating the presence of Nrf2 in the ARE-binding complex. As EMSA is a more sensitive assay than Western blot analysis, this may explain the apparent differences in kinetics between Nrf2 protein detection (Fig. 2⇑a) and DNA binding (Fig. 2⇑b) in the nucleus. THP-1 cells were then transiently transfected with a dominant negative mutant of Nrf2 to confirm a role for Nrf2 in LPS-induced HO-1 mRNA expression. Cells transfected with the vector control (pcDNA3) expressed an 8-fold increase in HO-1 mRNA expression in response to LPS when compared with unstimulated cells containing pcDNA3 (Fig. 3⇓a). The dominant negative Nrf2 mutant inhibited LPS-induced HO-1 mRNA expression by 75%. As a negative control, the effect of the dominant negative Nrf2 mutant on LPS-induced TNF-α expression was also examined. The TNF-α promoter does not contain ARE sites, and therefore, its expression should not be altered by the Nrf2 mutant. Transfection of THP-1 cells with the dominant negative Nrf2 mutant resulted in no change in LPS-induced TNF-α expression when compared with pcDNA3-transfected cells (Fig. 3⇓b), suggesting that Nrf2 does not play a role in LPS-induced TNF-α expression in these cells. To determine transient transfection efficiency, a GFP reporter plasmid was transfected into THP-1 cells, and GFP-positive cells were detected by flow cytometry. Using this method, the transfection efficiency of THP-1 cells was 41.4 ± 3.77% (mean ± SD; n = 3). Taken together, these results demonstrate that Nrf2 plays a key role in LPS-induced HO-1 mRNA expression in human THP-1 cells. A dominant negative mutant of Nrf2 suppresses LPS-induced HO-1 but not TNF-α mRNA expression in THP-1 cells. THP-1 cells were transiently transfected with 1 μg of a dominant negative Nrf2 mutant (pcDNA3-Nrf2) or control vector (pcDNA3) for 48 h. Cells were then untreated or treated with LPS (10 μg/ml) for 4 h. RNA was extracted, and after reverse transcription, real-time PCR was used to analyze (a) HO-1 or (b) TNF-α mRNA expression. Data shown represents four experiments (mean ± SD). The intracellular pathways between TLR4 and Nrf2 have not been determined. LPS has been reported to activate many kinase pathways in monocytes, including the MAPKs, PI3K and PKC (22). The potential role of these pathways in LPS-induced HO-1 expression was examined in monocytic cells using kinase-specific inhibitors. These included a PI3 kinase pathway inhibitor (LY294002), a pan-PKC inhibitor (Ro-31-8220), a p38 inhibitor (SB203580), and a MEK1/2 inhibitor (PD98059). Monocytes and THP-1 cells were pretreated with inhibitors for 30 min before stimulation with LPS for 8 h. RNA was extracted and reverse transcribed, and real-time PCR analysis demonstrated that Ro-31-8220 completely inhibited LPS-induced HO-1 expression in human monocytes (Fig. 4⇓a). HO-1 up-regulation by LPS was also partially inhibited by SB203580 (31%). Similar results were seen in THP-1 cells (Fig. 4⇓b). As positive controls, the effects of these inhibitors on LPS-induced TNF-α production in THP-1 cells were examined by ELISA. As expected, LPS-induced TNF-α expression was inhibited by the same concentrations of PD98059, SB203580, and Ro-31-8220 and enhanced by LY294002 (data not shown) (22, 40). Α dose-dependent inhibition of LPS-induced HO-1 mRNA expression in THP-1 cells was observed with 1–10 μM Ro-31-8220 (data not shown). The role of PKC in LPS-induced Nrf2 activation was then examined using Ro-31-8220 in THP-1 cells. THP-1 cells were pretreated with Ro-31-8220 for 30 min before LPS stimulation for 1 h and nuclear extracts prepared. Gel shift analysis demonstrated that LPS-induced Nrf2 binding to the HO-1 ARE was dose dependently inhibited by Ro-31-8220 (Fig. 4⇓c). These results suggest that PKC mediates LPS-induced HO-1 expression and binding of Nrf2 to the HO-1 ARE in human monocytic cells. 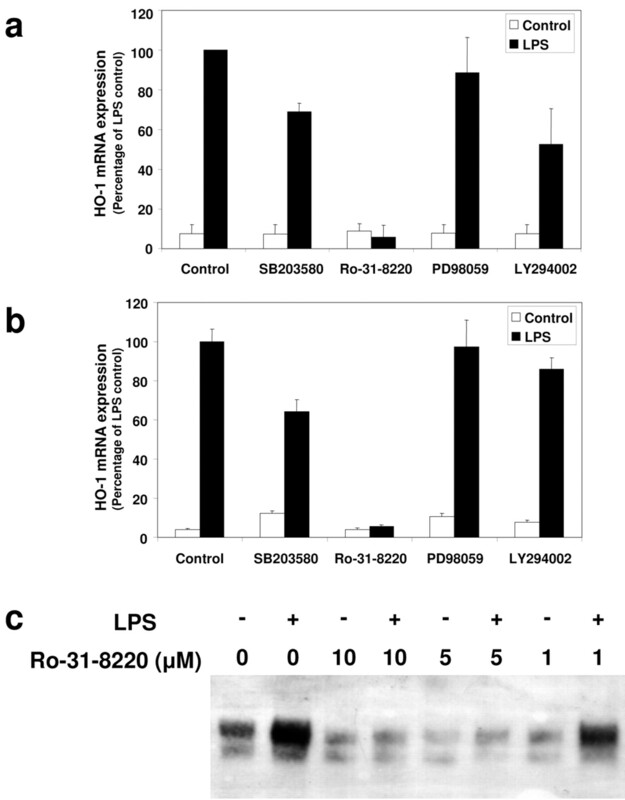 Ro-31-8220 inhibits LPS-induced HO-1 mRNA expression and Nrf2 binding to the HO-1 ARE. Primary monocytes (a) or THP-1 cells (b) were preincubated with 25 μM PD98059, 20 μM SB203580, 10 μM Ro-31-8220, or 25 μM LY294002 before addition of LPS (100 ng/ml or 10 μg/ml, respectively) for 6 h. RNA was extracted, reverse transcription performed, and HO-1 mRNA expression was analyzed by real-time PCR and normalized to GAPDH. Data shown represents three experiments (mean ± SD). c, THP-1 cells were pretreated with 0–10 μM Ro-31-8220 for 30 min before addition of LPS (10 μg/ml) for 1 h. Nuclear extracts were prepared, and EMSA was performed using a biotinylated HO-1-ARE oligonucleotide probe. PKC consists of a family of at least 10 mammalian isoforms, subdivided into three classes: the classical, novel, and atypical PKC isoforms. Go 6976 selectively inhibits the classical isoforms PKC α and β1 at micromolar concentrations (41). To determine whether classical PKC isoforms play a role in the LPS-induced HO-1 pathway, monocytes and THP-1 cells were preincubated for 30 min with Go 6976 before LPS stimulation. Go 6976 (5 μM) inhibited LPS-induced HO-1 mRNA expression in primary monocytes (Fig. 5⇓a) and THP-1 cells (Fig. 5⇓b), suggesting that classical PKC isoforms may play a role in LPS-induced HO-1 mRNA expression. The effect of Go 6976 on LPS-induced HO-1 mRNA expression was dose dependent (data not shown). We have reported previously that curcumin induces HO-1 mRNA expression in THP-1 cells (42). 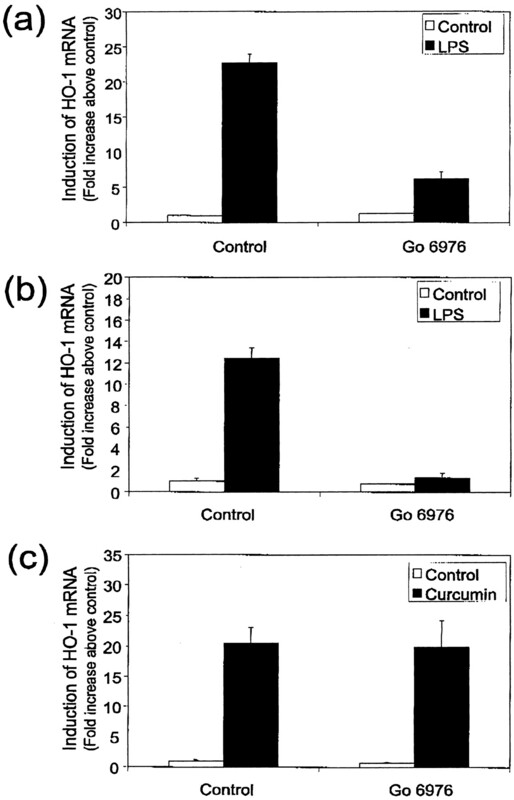 In contrast to LPS, curcumin-induced HO-1 mRNA expression was not inhibited by Go 6976 (Fig. 5⇓c), confirming that Go 6976 was specific to the LPS pathway in these cells. As a control, the effect of rottlerin on LPS-induced HO-1 mRNA expression was examined in THP-1 cells. A total of 15 μM rottlerin inhibits the nonclassical PKC δ isoform but has no effect on classical isoforms at this concentration (43). In addition, 15 μM rottlerin inhibits LPS-induced PKC δ translocation and TNF-α secretion in human monocytes but has no effect on the classical isoform, PKC α, at this dose (44). In THP-1 cells, 15 μM rottlerin had no significant effect on LPS-induced HO-1 mRNA expression, suggesting that the novel PKC δ isoform is not important in this pathway (data not shown). Go 6976 (10 μM) also inhibited LPS-induced Nrf2 nuclear translocation (data not shown). These results suggest that LPS-induced Nrf2 binding to the HO-1 ARE in THP-1 cells requires a classical PKC isoform. Go 6976 inhibits HO-1 mRNA expression induced by LPS but not curcumin. Primary monocytes (a) or THP-1 cells (b and c) were preincubated with Go 6976 (5 μM) before addition of LPS (100 ng/ml or 10 μg/ml, respectively) for 4 h or curcumin (5 μM) for 4 h. RNA was extracted, reverse transcription performed, and HO-1 mRNA expression was analyzed by real-time PCR and normalized to GAPDH. Data shown represents three experiments (mean ± SD). Monocytes play a key role in sepsis (10). LPS induces monocytes and macrophages to produce a wide variety of proinflammatory mediators, growth factors, and intracellular autoprotective molecules (9, 11, 13). The present study demonstrates that HO-1, a cytoprotective enzyme, is markedly increased in primary human monocytes and THP-1 cells exposed to LPS. Most research to date has focused on rodent models, where others have reported LPS-induced HO-1 expression in peritoneal and tissue macrophages (7, 8, 9, 14, 15). LPS also increases HO-1 expression in vivo. In mice exposed to LPS, HO-1 is induced in various tissues, including liver, kidney, spleen, intestine, and peritoneal and tissue macrophages (45, 46). In addition, HO-1-null mice exposed to endotoxin exhibit higher mortality rates and incidence of end-organ damage than wild-type littermates (18, 19), suggesting that HO-1 plays a key role in protecting the host during sepsis. HO-1 expression in monocytes and macrophages is thought to mediate potent anti-inflammatory effects, possibly by restraining them from inducing tissue injury and by modulating their role in the inflammatory response (6). We have found that basal HO-1 mRNA expression is high in human monocytes, when compared with other nonphagocytic cells, including primary lymphocytes and endothelial cells (our unpublished observations), using real-time PCR analysis, suggesting that these cells may be primed to cope with oxidative stress. Interestingly, HO-1 protein expression was undetectable in resting human monocytes and THP-1 cells in this study. Although the differences between mRNA and protein expression may be a result of differences in sensitivities between real-time PCR and Western blot analysis, it is also possible that HO-1 is posttranscriptionally regulated in these cells. Basal HO-1 protein expression has been detected in murine monocytes and macrophages (8, 47). This may be due to differences among species or possibly a result of different experimental conditions. Early experiments in our laboratory demonstrated that HO-1 can be up-regulated by passaging. Therefore, monocytes and THP-1 cells are rested overnight before carrying out experiments to minimize erroneous results from cell culture. Song et al. (15) demonstrated that LPS-induced HO-1 expression was regulated by TLR4, although the signaling pathways were yet to be elucidated. The 5′-untranslated regions of the human and murine HO-1 genes contain many putative regulatory elements. Most studies to date have focused on the mouse, which has some similar response elements to the human HO-1 gene, including AP-1 sites, heme- and cadmium-response elements, and phorbol ester-response elements (14, 23, 24, 25). ARE sites are present in the promoters of various cytoprotective and antioxidant genes (26). Several ARE sites have been identified in the 5′-untranslated region of the murine HO-1 gene, two of which are present in a 268 base region ∼4 kb upstream of the transcription start site known as the SX2 enhancer, which is responsive to LPS (48). The human HO-1 5′-flanking region also contains three AREs in this region. The ARE sites in these regions in the human and mouse HO-1 genes overlap with AP-1 sites (14, 48). Earlier studies in murine models suggested that AP-1 regulated LPS-induced HO-1 expression in macrophages (14). These studies described an increase in AP-1 transcriptional activity in response to LPS, and deletion analysis of the AP-1 sites in the HO-1 promoter abolished HO-1 transcriptional activity, also abolishing ARE-mediated transcriptional activation. Earlier studies also suggested that AP-1 proteins bind to the ARE. However, more recent reports have failed to confirm that AP-1 proteins play a major role in mediating the ARE response. Furthermore, in vitro DNA-binding assays demonstrate that in hepatocytes, AP-1 proteins do not bind to the ARE with high affinity and specificity (49, 50). In addition, AP-1 is a complex of immediate early response genes that are synthesized upon activation. The kinetics of complex binding to the ARE in the present study (detected by 15 min) suggest that AP-1 does not bind to the ARE in response to LPS in human monocytic cells. More recently, interest has increased in the role of the transcription factor Nrf2 in ARE-mediated regulation of gene expression (49, 50). Nrf2 has been shown to be important in ARE-mediated gene induction of phase II detoxification enzymes and antioxidant proteins in response to a number of stimuli, including laminar flow, oxidative stress, and chemopreventive agents (26, 27, 28, 51). Nrf2 has also been found to regulate oxidative stress-induced HO-1 expression in murine peritoneal macrophages (28). In addition, fibroblasts from Nrf2-knockout mice express reduced levels of HO-1 (30). These studies suggest that HO-1 induction is dependent on the expression and activation of Nrf2. In a recent study, Srisook and Cha (52) reported that Nrf2 is detected in the nucleus of RAW264.7 murine macrophages at 4 h after stimulation with LPS. In the present study, Nrf2 was detected in human monocytes and THP-1 cells. In response to LPS, Nrf2 disappeared from the cytosol and appeared in the nucleus of THP-1 cells. The kinetics of Nrf2 disappearance from the cytosol coincided with binding of a complex to the ARE of the HO-1 promoter, and supershift analysis confirmed the presence of Nrf2 in the complex, indicating that this transcription factor plays a key role in LPS-induced ARE-mediated HO-1 expression in human monocytic cells. Furthermore, a dominant negative Nrf2 mutant transiently transfected into THP-1 cells almost completely inhibited LPS-induced HO-1 mRNA expression. These results demonstrate that Nrf2 plays a key role in LPS-induced ARE-mediated HO-1 expression in human monocytic cells. Many kinases and signaling pathways in monocytes are stimulated in response to LPS (22). The identity of kinases involved in LPS-induced HO-1 expression in human monocytes and THP-1 cells was examined in this study using specific inhibitors of kinase pathways. We and others have reported previously that the MAPK pathways, ERK and p38, are induced by LPS in monocytes and play a role in LPS-induced TNF-α expression in these cells (22, 36, 53). Furthermore, these kinases have been implicated in oxidative and antioxidative-induced HO-1 expression in hepatocytes (54, 55). However, the results from this study suggest that ERK and p38 do not play a key role in LPS-induced HO-1 expression in THP-1 cells because their inhibitors had little effect on LPS-induced HO-1 mRNA expression in these cells. LPS also activates PI3K in THP-1 cells (40). PI3K has been reported to play a role in HO-1 expression and Nrf2 activation in neuroblastoma and phaeochromacytoma cells in response to hemin and carnosol (56, 57). In addition, a recent study has reported that the transcription factor Ets-2 plays a role in LPS-induced HO-1 expression in murine macrophages via PI3K phosphorylation (47). In the present study, 25 μM of the specific PI3K inhibitor, LY294002, had no effect on LPS-induced HO-1 expression in THP-1 cells and had a minor effect in monocytes, suggesting that PI3K does not play a significant role in LPS-induced HO-1 induction in human monocytic cells. We and others have reported previously that LPS induces PKC in human monocytes, THP-1 cells, and macrophages (22, 37, 44, 58). The present results using Ro-31-8220, a pan-PKC inhibitor, indicate that PKC mediates LPS-induced HO-1 expression in human monocytes. Other proinflammatory stimuli, including the cytokines TNF and IL-1α, have been reported to induce HO-1 expression in human endothelial cells via PKC (4). Oxidative stress-induced HO-1 expression via phorone, a glutathione depletor, and 4-hydroxy-2,3-nonenal, an end product of lipid peroxidation, are also inhibited by Ro-31-8220 in human lung fibroblasts (59). In this study, we also demonstrated that PKC mediates LPS-induced Nrf2 translocation in THP-1 cells, using the pan-specific PKC inhibitor Ro-31-8220. Similarly, the PKC-specific inhibitors staurosporine, Ro-32-0432 and calphostin C, have been reported to inhibit phorbol 12-myristate 13-acetate- and tert-butyl hydroquinone-induced Nrf2 nuclear translocation in HepG2 cells (51, 59). Furthermore, recent studies in murine HepG2 cells have demonstrated that phosphorylation of Nrf2 on S40 by PKC facilitates the dissociation of Nrf2 from its cytosolic inhibitor, Keap 1 (60, 61). PKC consists of a family of at least 10 mammalian serine/threonine kinases (58). Many are activated in response to LPS (Refs.22 , 37 , 58 and unpublished results from our laboratory). A total of 15 μM rottlerin did not markedly inhibit LPS-induced HO-1 mRNA expression in this study, suggesting that PKC δ is not required for this pathway. However, Go 6976 (a classical PKC inhibitor at the concentrations used in this study) completely inhibited LPS-induced Nrf2 binding to the ARE and markedly reduced LPS-induced HO-1 mRNA expression in both monocytes and THP-1 cells, suggesting that a classical PKC isoform is important for HO-1 expression induced by LPS. Studies are underway to identify the classical PKC isoform involved. Curcumin has been reported to induce HO-1 expression in murine macrophages, bovine aortic endothelial cells, and porcine renal epithelial cells and we have demonstrated previously that curcumin induces HO-1 mRNA expression in THP-1 cells (42). Although Go 6976 inhibited LPS-induced HO-1 mRNA in THP-1 cells in the present study, it had no effect on curcumin-induced HO-1 mRNA expression. Curcumin activation of HO-1 is regulated by Nrf2 in renal epithelial cells (62). However, in contrast to LPS, this appears to be mediated through p38 MAPK. These results suggest that LPS and curcumin may use different kinases upstream to activate Nrf2. In summary, we have shown that in human monocytic cells, up-regulation of HO-1 by LPS is dependent on Nrf2. Furthermore, we report that a classical isoform of PKC is an important modulator of this response. Results were similar in primary monocytes and THP-1 cells, suggesting that the THP-1 cell line is a valid model to study HO-1 regulation in monocytes. HO-1 may protect against the detrimental effects of LPS in the pathogenesis of endotoxic shock. Indeed, HO-1 deficiency results in increased mortality from endotoxin and HO-1 overexpression protects against the deleterious effects of pleurisy elicited by carrageenan in rats (63). In addition, polymorphisms in the HO-1 gene have been associated with various types of vascular disease (64, 65, 66), therefore studies undertaken to increase our understanding of the regulation of HO-1 in sepsis is timely. ↵2 Abbreviations used in this paper: HO, heme oxygenase; ARE, antioxidant response element; Nrf2, NF-E2 related factor 2; PKC, protein kinase C.
Otterbein, L. E., A. M. Choi. 2000. Heme oxygenase: colors of defense against cellular stress. Am. J. Physiol. 279:L1029.-L1037. Baranano, D. E., M. Roa, C. D. Ferris, S. H. Snyder. 2002. Biliverdin reductase: a major physiologic cytoprotectant. Proc. Natl. Acad. Sci. USA 99:16093.-16098. Immenschuh, S., G. Ramadori. 2000. Gene regulation of heme oxygenase-1 as a therapeutic target. Biochem. Pharmacol. 60:1121.-1128. Terry, C. M., J. A. Clikeman, J. R. Hoidal, K. S. Callahan. 1999. TNF-α and IL-1α induce heme oxygenase-1 via protein kinase C, Ca2+, and phospholipase A2 in endothelial cells. Am. J. Physiol. 276:H1493.-H1501. Ryter, S. W., A. M. Choi. 2002. Heme oxygenase-1: molecular mechanisms of gene expression in oxygen-related stress. Antioxid. Redox Signal. 4:625.-632. Otterbein, L. E., M. P. Soares, K. Yamashita, F. H. Bach. 2003. Heme oxygenase-1: unleashing the protective properties of heme. Trends Immunol. 24:449.-456. Vayssier-Taussat, M., T. Camilli, Y. Aron, C. Meplan, P. Hainaut, B. S. Polla, B. Weksler. 2001. Effects of tobacco smoke and benzoapyrene on human endothelial cell and monocyte stress responses. Am. J. Physiol. 280:H1293.-H1300. Lee, T.-S., L.-Y. Chau. 2002. Heme oxygenase-1 mediates the anti-inflammatory effect of interleukin-10 in mice. Nat. Med. 8:240.-247. Immenschuh, S., J. Stritzke, S.-I. Iwahara, G. Ramadori. 1999. Up-regulation of heme-binding protein 23 (HBP23) gene expression by lipopolysaccharide is mediated via a nitric oxide-dependent signaling pathway in rat Kupffer cells. Hepatology 30:118.-127. Rietschel, E. T., H. Brade. 1992. Bacterial endotoxins. Sci. Am. 267:54.-61. Sweet, M. J., D. A. Hume. 1996. Endotoxin signal transduction in macrophages. J. Leukocyte Biol. 60:8.-26. Carraway, M. S., A. J. Ghio, J. L. Taylor, C. A. Piantadosi. 1998. Induction of ferritin and heme oxygenase-1 by endotoxin in the lung. Am. J. Physiol. 275:L583.-L592. Fincato, G., N. Polentarutti, A. Sici, A. Mantovani, F. Colotta. 1991. Expression of a heat-inducible gene of the HSP70 family in human myelomonocytic cells: regulation by bacterial products and cytokines. Blood 77:579.-586. Camhi, S. L., J. Alam, G. W. Wiegand, B. Y. Chin, A. M. K. Choi. 1998. Transcriptional activation of the HO-1 gene by lipopolysaccharide is mediated by 5′ distal enhancers: role of reactive oxygen intermediates and AP-1. Am. J. Respir. Cell Mol. Biol. 18:226.-234. Song, Y., Y. Shi, L.-H. Ao, A. H. Harken, X.-Z. Meng. 2003. TLR4 mediates LPS-induced HO-1 expression in mouse liver: role of TNF-α and IL-1β. World J. Gastroenterol. 9:1799.-1803. Wang, W. W., D. L. Smith, S. D. Zucker. 2004. Bilirubin inhibits iNOS expression and NO production in response to endotoxin in rats. Hepatology 40:424.-433. Sarady, J. K., B. S. Zuckerbraun, M. Bilban, O. Wagner, A. Usheva, F. Liu, E. Ifedigbo, R. Zamora, A. M. Choi, L. E. Otterbein. 2004. Carbon monoxide protection against endotoxic shock involves reciprocal effects on iNOS in the lung and liver. FASEB J. 18:854.-856. Chen, Y. H., S. F. Yet, M. A. Perrella. 2003. Role of heme oxygenase-1 in the regulation of blood pressure and cardiac function. Exp. Biol. Med. 228:447.-453. Poss, K. D., S. Tonegawa. 1997. Reduced stress defense in heme oxygenase 1-deficient cells. Proc. Natl. Acad. Sci. USA 94:10925.-10930. Kapturczak, M. H., C. Wasserfall, T. Brusko, M. Campbell-Thompson, T. M. Ellis, M. A. Atkinson, A. Agarwal. 2004. Heme oxygenase-1 modulates early inflammatory responses: evidence from the heme oxygenase-1-deficient mouse. Am. J. Pathol. 165:1045.-1053. O’Connell, M. A., B. L. Bennett, F. Mercurio, A. M. Manning, N. Mackman. 1998. Role of IKK1 and IKK2 in lipopolysaccharide signaling in human monocytic cells. J. Biol. Chem. 273:30410.-30414. Guha, M., N. Mackman. 2001. LPS induction of gene expression in human monocytes. Cell. Signal. 13:85.-94. Favatier, F., B. S. Polla. 2000. Tobacco-smoke-inducible human haem oxygenase-1 gene expression: role of distinct transcription factors and reactive oxygen intermediates. Biochem. J. 353:475.-482. Kurata, S., M. Matsumoto, Y. Tsuji, H. Nakajima. 1996. Lipopolysaccharide activates transcription of the heme oxygenase gene in mouse M1 cells through oxidative activation of nuclear factor-κB. Eur. J. Biochem. 239:566.-571. Hill-Kapturczak, N., E. Sikorski, C. Voakes, J. Garcia, H. S. Nick, A. Agarwal. 2003. An internal enhancer regulates heme- and cadmium-mediated induction of human heme oxygenase-1. Am. J. Physiol. 285:F515.-F523. Chen, X. L., S. E. Varner, A. S. Rao, J. Y. Grey, S. Thomas, C. K. Cook, M. A. Wasserman, R. M. Medford, A. K. Jaiswal, C. Kunsch. 2003. Laminar flow induction of antioxidant response element-mediated genes in endothelial cells. A novel anti-inflammatory mechanism. J. Biol. Chem. 278:703.-711. Jaiswal, A. K.. 2004. Nrf2 signaling in coordinated activation of antioxidant gene expression. Free Radic. Biol. Med. 36:1199.-1207. Lee, M.-J., M. J. Calkins, K. Chan, Y. W. Kan, J. A. Johnson. 2003. Identification of the NF-E2-related factor-2-dependent genes conferring protection against oxidative stress in primary cortical astrocytes using oligonucleotide microarray analysis. J. Biol. Chem. 278:12029.-12038. Alam, J., D. Stewart, C. Touchard, S. Boinapally, A. M. Choi, J. L. Cook. 1999. Nrf2, a Cap‘n’Collar transcription factor, regulates induction of the heme oxygenase-1 gene. J. Biol. Chem. 274:26071.-26078. Leung, L., M. Kwong, S. Hou, C. Lee, J. Y. Chan. 2003. Deficiency of the Nrf1 and Nrf2 transcription factors results in early embryonic lethality and severe oxidative stress. J. Biol. Chem. 278:48021.-48029. Cho, Y., A. E. Jedlicka, S. P. Reddy, T. W. Kensler, M. Yamamoto, L. Y. Zhang, S. R. Kleeberger. 2002. Role of NRF2 in protection against hyperoxic lung injury in mice. Am. J. Respir. Cell Mol. Biol. 26:175.-182. Tsuchiya, S., M. Yamabe, Y. Yamaguchi, Y. Kobayashi, T. Konno. 1980. Establishment and characterization of a human acute monocytic leukemia cell line (THP-1). Int. J. Cancer. 26:171.-176. Boyum, A.. 1968. Isolation of mononuclear cells and granulocytes from human blood: isolation of mononuclear cells by one centrifugation, and of granulocytes by combining centrifugation and sedimentation at 1 g. Scand. J. Clin. Lab. Invest. 97:77.-89. Cordle, S. R., R. Donald, M. A. Read, J. J. Hawiger. 1993. Lipopolysaccharide induces phosphorylation of MAD3 and activation of c-Rel and related NF-κB proteins in human monocytic THP-1 cells. J. Biol. Chem. 268:11803.-11810. Guha, M., M. A. O’Connell, R. Pawlinski, A. Hollis, P. McGovern, S.-F. Yan, D. Stern, N. Mackman. 2001. Lipopolysaccharide activation of the MEK-ERK1/2 pathway in human monocytic cells mediates tissue factor and tumor necrosis factor α expression by inducing Elk-1 phosphorylation and Egr-1 expression. Blood 98:1429.-1439. O’Connell, M. A., C. A. Charalambos, S. A. Rushworth. 2003. Protein kinase C isoform expression in human monocytic cells: differential roles in proinflammatory cytokine secretion. Eur. J. Biochem. 270:137. Itoh, K., N. Wakabayashi, T. Katoh, T. Ishii, K. Igarashi, J. D. Engel, M. Yamamoto. 1999. Keap1 represses nuclear activation of antioxidant responsive elements by Nrf2 through binding to the amino-terminal Neh2 domain. Genes Dev. 13:76.-86. Rushworth, S. A., M. A. O’Connell. 2004. Haem oxygenase-1 in inflammation. Biochem. Soc. Trans. 32:1093.-1094. Guha, M., N. Mackman. 2002. The phosphatidylinositol 3-kinase-Akt pathway limits lipopolysaccharide activation of signaling pathways and expression of inflammatory mediators in human monocytic cells. J. Biol. Chem. 277:32124.-32132. Martiny-Baron, G., M. G. Kazanietz, H. Mischak, P. M. Blumberg, G. Kochs, H. Hug, D. Marme, C. Schachtele. 1993. Selective inhibition of protein kinase C isozymes by the indolocarbazole Go 6976. J. Biol. Chem. 268:9194.-9197. Ogborne, R. M., S. A. Rushworth, C. A. Charalambos, M. A. O’Connell. 2004. Haem oxygenase-1: a target for dietary antioxidants. Biochem. Soc. Trans. 32:1003.-1005. Gschwendt, M., H. J. Muller, K. Kielbassa, R. Zang, W. Kittstein, G. Rincke, F. Marks. 1994. Rottlerin, a novel protein kinase inhibitor. Biochem. Biophys. Res. Commun. 199:93.-98. Kontny, E., M. Kurowska, K. Szczepanska, W. Maslinski. 2000. Rottlerin, a PKC isozyme-selective inhibitor, affects signalling events and cytokine production in human monocytes. J. Leukocyte Biol. 67:249.-258. Oshiro, S., H. Takeuchi, M. Matsumoto, S.-I. Kurata. 1999. Transcriptional activation of heme oxygenase-1 gene in mouse spleen, liver and kidney cells after treatment with lipopolysaccharide or hemoglobin. Cell Biol. Int. 23:465.-474. Fujii, H., T. Takahashi, K. Nakahira, K. Uehara, H. Shimizu, M. Matsumi, K. Morita, M. Hirakawa, R. Akagi, S. Sassa. 2003. Protective role of heme oxygenase-1 in the intestinal tissue injury in an experimental model of sepsis. Crit. Care Med. 31:893.-902. Chung, S. W., Y.-H. Chen, M. A. Perrella. 2005. Role of Ets-2 in the regulation of heme oxygenase-1 by endotoxin. J. Biol. Chem. 280:4578.-4584. Prestera, T., P. Talalay, J. Alam, Y. I. Ahn, P. J. Lee, A. M. Choi. 1995. Parallel induction of heme oxygenase-1 and chemoprotective phase 2 enzymes by electrophiles and antioxidants: regulation by upstream antioxidant-responsive elements (ARE). Mol. Med. 1:827.-837. Otterbein, L. E., A. M. K. Choi. 2002. The saga of leucine zippers continues: in response to oxidative stress. Am. J. Respir. Cell Mol. Biol. 26:161.-163. Nguyen, T., P. J. Sherratt, C. B. Pickett. 2002. Regulatory mechanisms controlling gene expression mediated by the antioxidant response element. Annu. Rev. Pharmacol. Toxicol. 43:233.-260. Huang, H.-C., T. Nguyen, C. B. Pickett. 2000. Regulation of the antioxidant response element by protein kinase C-mediated phosphorylation of NF-E2-related factor 2. Proc. Natl. Acad. Sci. USA 97:12475.-12480. Srisook, K., Y.-N. Cha. 2005. Super-induction of HO-1 in macrophages stimulated with lipopolysaccharide by prior depletion of glutathione decreases iNOS expression and NO production. Nitric Oxide 12:70.-79. Han, J., J.-D. Lee, L. Bibbs, R. J. Ulevitch. 1994. A MAP kinase targeted by endotoxin and hyperosmolarity in mammalian cells. Science 265:808.-811. Kietzmann, T., A. Samoylenko, S. Immenschuh. 2003. Transcriptional regulation of heme oxygenase-1 gene expression by MAP kinases of the JNK and p38 pathways in primary cultures of rat hepatocytes. J. Biol. Chem. 278:17927.-17936. Zipper, L. M., R. T. Mulcahy. 2003. Erk activation is required for Nrf2 nuclear localization during pyrrolidine dithiocarbamate induction of glutamate cysteine ligase modulatory gene expression in HepG2 cells. Toxicol. Sci. 73:124.-134. Nakaso, K., H. Yano, Y. Fukuhara, T. Takeshima, K. Wada-Isoe, K. Nakashima. 2003. PI3K is a key molecule in the Nrf2-mediated regulation of antioxidative proteins by hemin in human neuroblastoma cells. FEBS Lett. 546:181.-184. Martin, D., A. I. Rojo, M. Salinas, R. Diaz, G. Gallardo, J. Alam, C. M. De Gallaretta, A. Cuadrado. 2004. Regulation of heme oxygenase-1 expression through the phosphatidylinositol 3-kinase/Akt pathway and the Nrf2 transcription factor in response to the antioxidant phytochemical carnosol. J. Biol. Chem. 279:8919.-8929. Chen, C.-C, J.-K. Wang, W.-C. Chen, B. S. Lin. 1998. Protein kinase Cη mediates lipopolysaccharide -induced nitric-oxide synthase expression in primary astrocytes. J. Biol. Chem. 273:19424.-19430. Numazawa, S., M. Ishikawa, A. Yoshida, S. Tanaka, T. Yoshida. 2003. Atypical protein kinase C mediates activation of NF-E2-related factor 2 in response to oxidative stress. Am. J. Physiol. 285:C334.-C342. Bloom, D. A., A. K. Jaiswal. 2003. Phosphorylation of Nrf2 at Ser40 by protein kinase C in response to antioxidants leads to the release of Nrf2 from INrf2, but is not required for Nrf2 stabilization/accumulation in the nucleus and transcriptional activation of antioxidant response element-mediated NAD(P)H:quinone oxidoreductase-1 gene expression. J. Biol. Chem. 278:44675.-44682. Huang, H. C., T. Nguyen, C. B. Pickett. 2002. Phosphorylation of Nrf2 at Ser-40 by protein kinase C regulates antioxidant response element-mediated transcription. J. Biol. Chem. 277:42769.-42774. Balogun, E., M. Hoque, P. Gong, E. Killeen, C. J. Green, R. Foresti, J. Alam, R. Motterlini. 2003. Curcumin activates the haem oxygenase-1 gene via regulation of Nrf2 and the antioxidant-responsive element. Biochem J. 371:887.-895. Willis, D., A. R. Moore, R. Frederick, D. A. Willoughby. 1996. Heme oxygenase: a novel target for the modulation of the inflammatory response. Nat. Med. 2:87.-90. Ono, K., T. Mannami, N. Iwai. 2003. Association of a promoter variant of the heme oxygenase-1 gene with hypertension in women. J. Hypertens. 21:1497.-1503. Kaneda, H., M. Ohno, J. Taguchi, M. Togo, H. Hashimoto, K. Ogasawara, T. Aizawa, N. Ishizaka, R. Nagai. 2002. Heme oxygenase-1 gene promoter polymorphism is associated with coronary artery disease in Japanese patients with coronary risk factors. Arterioscler. Thromb. Vasc. Biol. 22:1680.-1685. Schillingerm, M., M. Exner, W. Mlekusch, H. Domanovits, K. Huber, C. Mannhalter, O. Wagner, E. Minar. 2002. Heme oxygenase-1 gene promoter polymorphism is associated with abdominal aortic aneurysm. Thromb. Res. 106:131.-136.